Spring is a glorious season in the Natural State, and each year we gardeners excitedly prowl garden paths looking for signs of activity. One of the hard-to-miss markers of the passing of winter is the blooming of deciduous magnolias. These come in a wide array of clones that bloom during the iffy days of late winter up until later in the spring, when their blooming is assured. Magnolias are an old group of flowering plants with recognizable fossil relatives dating back at least 95 million years during the reign of the dinosaurs. Because they began their march into the present while the continents were shuffling around and before major mountain ranges formed, they are scattered widely about the globe. Being one of the first flowering plant families, they appeared before bees so their flowers are pollinated by beetles, and in modern times, by man. As with many plants, DNA analysis of the species historically considered “magnolias” has created more confusion than clarity. Before DNA analysis, our native southern magnolia fit comfortably in the group we know as magnolias. But about 20 years ago, lab work showed that our evergreen southern magnolia was more distantly related to the Asian deciduous magnolias than previously thought. To make matters worse, the Asian magnolias were more closely related to a group of magnolia family relatives assigned to distinct genera than they were to our southern magnolia. So the number of magnolias in the genus is a bit confused, ranging from about 120 species to 280. The deciduous flowering magnolias that bloom in our gardens in early spring are mostly of hybrid origins, a process that began in France in 1820. The first of these hybrids was created by a retired and frustrated Napoleonic war veteran who crossed the Chinese species M. denudate and M. liliiflora to create the early flowering Magnolia x soulangeana, the saucer magnolia. This old lavender and white flowered stalwart is still grown to the delight and frustration of gardeners everywhere. While beautiful, these 30-foot-tall rounded trees bloom so early that late spring freezes destroy the opening blooms two years out of five on average. In the 1955-56, a pair of U.S. Department of Agriculture scientists working at the National Arboretum in Washington, D.C. made a series of magnolia crosses with the goal of pushing the blooming time back to avoid bloom loss. In 1968, William Kosar released eight selections, all given girl names, that all bloom about two weeks later than the saucer or star magnolia. “Jane” is the most common in the trade, probably because it is easiest to root, but the rosy, larger flowered “Ann” is my favorite. The yellow to cream flowered deciduous magnolias are based on our native cucumber tree (M. acuminata) being crossed with the Chinese Yulan magnolia (M. denudata). “Elizabeth” was the first of these and was patented in 1977; since then “Butterflies,” “Gold Star,” “Goldfinch” and many more have been introduced. The beautiful pink flowered “Daybreak” has the cucumber magnolia as a grandparent and is, in my opinion, one of the best magnolias for springtime display. These hybrids are mostly larger trees in the 30-40 foot range and bloom about 3-4 weeks after the saucer magnolias but still before leaves appear. 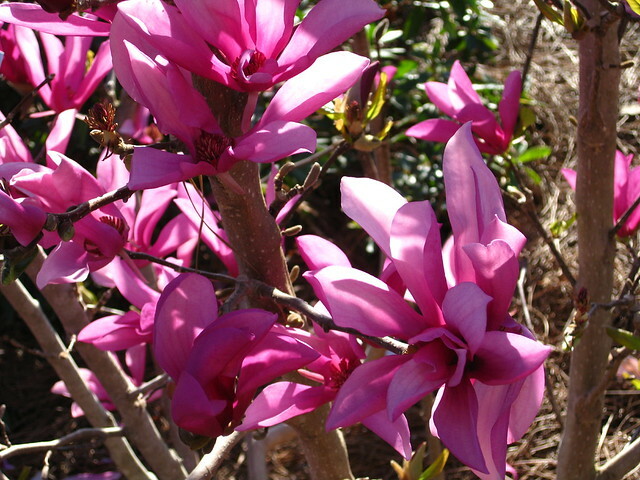 Deciduous magnolias are perfect specimen plants for the springtime garden. Planting on north-facing slopes or where they get some afternoon shade in the spring will delay early blooming and perhaps forestall freeze damage to the blooms. As a group they are easy to grow in average soil conditions and once established are long lived in the garden. For more information about horticulture or to see other Plant of the Week columns, visit Extension's Web site, http://www.uaex.edu/, or contact your county extension agent. The Cooperative Extension Service is part of the U of A Division of Agriculture.